After teasing a prototype for a new trainer made almost entirely from recycled ocean rubbish in late 2015, Adidas has now released the trainers for sale to the general public. Priced at $220, each pair of UltraBoost Uncaged Parley is created using 95% ocean plastic waste recovered from the waters around the Maldives. 7,000 pairs will initially be made available with Adidas stating an aim to create one million pairs in 2017 resulting in the re-use of 11 million plastic bottles. The initial design was announced as part of a partnership between the sports label and Parley for the Oceans - an organisation that aims to end pollution of the world’s oceans through partnerships with some of the top fashion and beauty brands helping save the oceans. 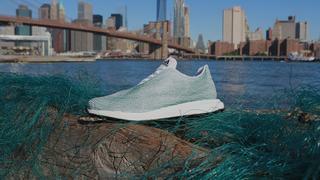 The upper trainer is made entirely of yarns and filaments reclaimed from illegal deep-sea gillnets and other ocean waste and it is hoped the prototype will help to raise awareness about ocean pollution. Parley for the Oceans founder Cyrill Gutsch added, "At Parley for the Oceans, we want to establish the oceans as a fundamental part of the debate around climate change. Our objective is to boost public awareness and to inspire new collaborations that can contribute to protect and preserve the oceans. We are extremely proud that adidas is joining us in this mission and is putting its creative force behind this partnership to show that it is possible to turn ocean plastic into something cool." In 2016 Adidas unveiled a further development using 3D printing to create a midsole comprised of recycled polyester and gillnets. 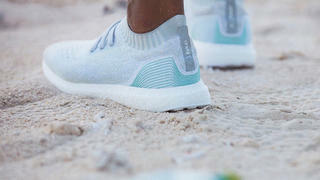 While it is not clear if this technology is used in the UltraBoost Uncaged Parley trainers, Adidas has taken a number of other steps to reduce its impact on the environment. These include a ban on plastic water bottles at the brand's headquarters, a promise to phase out plastic bags in stores by the end of 2016, a ban on plastic microbeads in its body care products and a partnership with Real Madrid and Bayern Munich to create football jerseys from ocean plastic waste.